The Insects T-Shirt!Okay, gang. Here’s the Insects appearance on the Night Shift television show in its entirety. Complete with closed captioned lyrics! The video previews appear in the order the songs were played on the show. My apologies for the low resolution- but they’re good enough to get the general idea. A couple of weeks ago I got an email from Steve Liggett, the art magnate who runs Living Arts in downtown Tulsa. 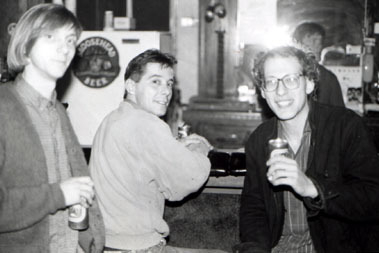 He was going through some old photos and found one of me and some co-horts circa 1986. That’s me on the right accompanied by Les Mobley (left) and Geoff Williams (center) as we’re sipping Tecates during a sound check at Club Nitro. Les played drums and is now a fixture with California alt-country sensation Red Meat. Club Nitro was on 6th Street just east of Peoria and offered live original music and the latest alternative bands. Radio Milan played frequently at the Nitro (or Club Knifehole as some referred to it) until the finances got muddled. But that’s another story. This photo was taken before a Radio Milan show that featured art between sets. We were oh-so ahead of our time! Anywho, that’s why Steve was there to snap said photo. Yuck. Another blast of freezing rain pelted Tulsa yesterday. In typical Oklahoma fashion the thermometer dropped from 65°F to below freezing in just a few hours. Our last winter blast left about ten inches of snow on the ground. This time we’re in for more ice as the temperatures at higher altitudes are above freezing. The rain freezes as it nears the ground! Once colder arctic air moves in, the air aloft will be colder so we’ll get snow. Right now they’re not predicting that will happen, so we could have three days of freezing rain and sleet. 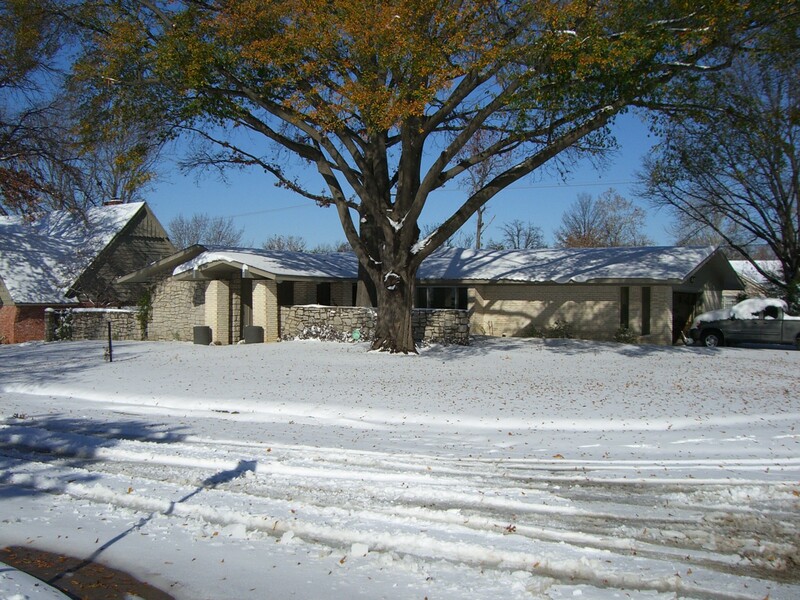 Hopefully we won’t have a repeat of 1987 when ice literally coated Tulsa and knocked out power to huge sections of the city. Trees and power lines were coated with a thick layer of ice and the night sky was a symphony of color as transformers began popping. Some neighborhoods were dark for two weeks! So far the brunt of the “ice coating” has been just southeast of us. Hopefully our luck holds out for the next couple of nights! In a former life I was a musical artist. If anyone remembers Tulsa’s new wave scene back in the early `80s they will remember Radio Milan. If you never inhaled you might also recall The Insects. That was the first name of this musical experiment, the name was changed to Radio Milan in 1982. We disbanded in 1987 after a terrible performance as the opening act for Wang Chung. Recordings from this golden age of punk are now available to the world through the miracle of the Internet! The first tracks are Radio Milan recordings that were released in 1986 as a cassette tape titled Musica la Dolce. Next up is the recording of “Mille Miglia” we offered up for the Explosive Sampler. This CD also features live recordings from a rare television appearance and the Crystal Pistol. June 29, 2008- Digital downloads are now available of selected Radio Milan and Insects music. The first batch are the six songs from the Musica La Dolcé cassette, originally released in 1986. Watch for more classic hits from the Eighties to be added soon. Clinton Riggs probably never considered himself a “graphic designer.” Heck, the term probably hadn’t even been invented back in 1939 when he was creating his magnum opus. But I’ll bet you’ve seen his work. They’re triangular and red & white. In some parts of the world they have no verbiage, but around here most of them just say YEILD. When Riggs first ventured into the world of traffic control systems and graphical designs he envisioned a device he called a “responsibility sign.” That would have probably never made it in this day and age, and fortunately the key element “yield” came along. The first signs said: “YIELD right of way” in black letters on a yellow background. In 1939 he tried to sell the idea to Tulsa’s municipal government to no avail. Ironically, interest from afar was enthusiastic about the idea. But it was still another ten years before the Yield sign really started rolling. Finally, in 1951 Captain Riggs took it upon himself to put his sign to work. Back then the most dangerous intersection in Tulsa was 1st Street and Columbia Avenue. For some reason no stop sign had ever been installed, even though accidents were common. Riggs had the world’s first Yield sign made to his specification out of his own pocket. He promptly mounted a pair on poles and planted them at 1st and Columbia. Accidents immediately decreased. Over time the Yield sign slowly became more common. There was some trepidation on the part of those that felt it was an unnecessary new sign. The thinking was– any intersection that merits slowing down needs to have a stop sign installed. Internationally acceptance was more rapid and letters poured in from around the world asking about design and implementation of the new sign. And then in the late Fifties came the Interstate Highway System. Suddenly roadways all across the nation were being built with merge lanes and exit ramps. Even cities built predominantly on a gridwork pattern, like Tulsa, were dealing with curved intersections where traffic flowed together. Perpendicular intersections were one thing, but no one was going to suggest putting a stop sign on a superhighway cloverleaf. The Yield sign was immediately requisite. I can remember seeing the distinctive original yellow signs as a child. In fact, I recall traveling to other cities and noticing unusual triangular Yield signs. It never occurred to me why there might be different styles of the same sign. Eventually triangular signs replaced all of the original keystone-shaped versions. Years later the Yield sign was “globalized” with a new coat of paint and now the yellow ones have all but vanished. Riggs retired in 1970 and is best known in the Department as the commander of the police-training academy, a job he held for many years. The southwest precinct of the TPD is named in his honor. His widow, Vera Riggs, still has that original prototype sign, along with those letters from all over the world. An example also resides in the Smithsonian. And to this day every officer of the Tulsa Police Department wears a small homage to this self-made graphic designer/traffic control engineer. If you look closely at their shoulder patch you can see a little bit of that very first black and yellow Yield sign. This article was originally written for the Tulsa channel on About.com in June 2000.